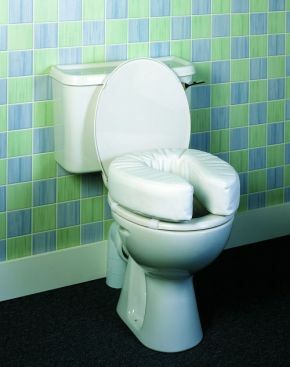 Padded Raised Toilet Seat Soft And Comfortable. A soft raised toilet seat cushion that attaches to the existing toilet seat to provide extra comfort and to raise the effective seat height. The cushion simply attaches with four hook and loop straps, so is easy to remove for cleaning. The white vinyl covering protects the cushion and is easily cleaned. It adjusts to the shape of the existing toilet seat. Good portable seat ideal to take on holiday . Nice item to provide raised seat as and when required, no need for a permanent fixing. Quick delivery.